At 168 km2 to our 10.08km2, around 16 Great Yarmouth towns would fit inside Tauranga’s city limits. Despite our latitude and magnitude differences, Tauranga does have its connection to our little seaside town here in the UK. Tauranga has an oceanic climate like Great Yarmouth. Our small town, however, cannot be described as sub-tropical! Whilst our average humidity levels are in the same region – Tauranga at 85.5% and Great Yarmouth at 81% – our summer temperatures don’t come close to the stunning weather in New Zealand in the spring. With Greater Tauranga being a popular tourist destination, both places see their populations swell during the summer months as holidaymakers descend upon them. Whilst we may not have any mountains with waterfalls and lakes, we do have popular beaches and natural attractions. The main similarity we have, however, is that all local people and holidaymakers, need to be kept safe during their day-to-day activities and at public open-air events. Tauranga City Council is responsible for around 530km of roads and approximately 700km of footpaths, cycleways and access ways and this means, along with numerous other duties, they are tasked with an incredible number of lighting columns to maintain. If you have thousands of steel lighting columns and you want to check they’re safe, how do you do it? A visual inspection can give you an indication but only above ground. 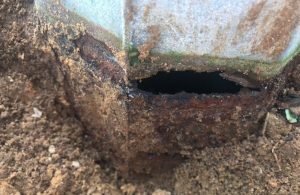 It’s highly likely that a lighting column will look to be in great condition above the surface, but below ground, corrosion could be affecting the foundations, and hence the stability and safety, of the lighting column. So, if you want to inspect below ground level, what are your options? You could set about digging up every column, but the costs are going to be astronomical and it’s not effective time management, not to mention the disruption it will cause to citizens and businesses. Therefore, you need something that will be quick, accurate and portable which also minimises disruption, labour and costs. This is where TVC’s ColcheK2 system comes up winning. It’s compact, hardwearing and designed specifically to detect corrosion in steel tubes such as lighting columns. The system is deployed from outside the column and a small internal search head detects losses in wall thickness from ground level to a 750mm depth below ground level. The critical area of any planted steel column is from ground level to approx. 200mm below ground. Water, road salt, other chlorides and oxygen from the air combine to make the area at, or just below ground level, a highly corrosive hotspot. This is the area most at risk from corrosion and is the highest stress point in the whole column. The vast majority of column failures and collapses happen in this small area. ColcheK2 easily covers this entire area accurately, giving reassurance that the column is in good condition (or otherwise) in this high failure area. 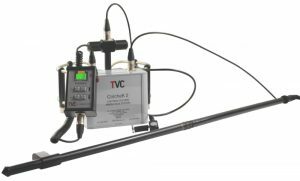 ColcheK2 has an optional ultrasonic range finding system to accurately feedback the search head depth inside the column. This feature is unique to the ColcheK2. The operator can locate and identify the depth of an actual defect and its significance to within 20mm of the defect depth. Using the normal access door, the ColcheK2 scans this critical area and the remaining below ground section of the column, giving an instant reading of the percentage loss of wall thickness. 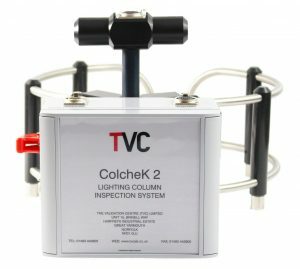 As the majority of TVC equipment can be bespoke-fitted with optional requirements, it is generally built-to-order so upon receiving approval from Tauranga Council, we set about manufacturing the ColcheK2 for them. The unit was delivered recently and within a week of receipt of the unit, we received an email from the council to show us exactly what they’d found. 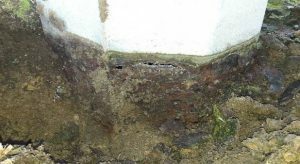 Excavations validated our findings…[using] a shovel to strike the column face, firstly above ground level– no damage, then below ground, to check for the level of corrosion(Image B).